Better Posture, Better Health in 10 Steps! Classical Yoga science views poor posture as the root of many maladies from depression to respiratory and heart ailments; thus proper posture is the cornerstone of the physical practice. Back pain is the most obvious affliction, but consider this: improper spinal alignment starts with the feet and works its way up through the joints–ankle,knee,hip, shoulder–affecting them all. Rotator cuff tear ? Poor rooting of humerus bones into the sockets perhaps due to thoracic kyphosis. Knee or hip pain? Maybe toeing out the feet too much, misplacing the head of the femur bones and throwing off the pelvis. These imbalances then ripple throughout the fascia (connective tissue) to neighboring joints, wrecking systemic havoc and causing pain. Making matters worse, another side effect of poor posture is poor breathing. The hunched position closes off the lungs and doesn’t allow for optimal diaphragmatic breathing. Shallow breathing can push us toward “fight or flight,” increasing the overall resting tension of the body, making us feel irritable and worsening,…posture. Now, you’re in a downward “slouch spiral” –throw in a dark, 40-below windchill day and you too could be an extra on the set of Grumpy Old Men. Stand with your feet a few inches apart, whatever is “normal,” for you. Notice, do the toes turn out like a duck or in, like a pigeon? Be a human! Set your feet straight so the insides of the feet are perfectly parallel to each other. Feel how doing that sets your knees, pelvis and maybe even shoulders in a better place. Place a yoga block between your thighs and you were gently squeezing it. You can use an actual block or rolled up bath towel. Place a yoga strap around your shin bones, between the knees and the ankles. Press gently out into your strap as you hug the block in. Once you activate these oppositional forces in harmony, you’ll feel the weight balance evenly over all your toe mounds, not just the big toe. Now, push down your toe mounds evenly –picking up the toe-tips will help, especially if you have weak arches. The muscles of the legs will activate and hug the bones. Lift the kneecaps to support the knees –a lot of knee problems result from not knowing to engage quads when standing. Place the shoulders in the sides of your body, so your upper back and upper chest feel the same width across. If you’ve been slouching for years, this may be difficult to sustain. Now, the head– if you drive, use a computer or sit on a sofa, it has probably been craning out WAY TOO FAR in front of your body. Level the chin, drawing it back to the throat until you feel the weight of the head over the tailbone and the tailbone over the heels and ankles. You should feel rooted through the heels and lighter on the front of your feet. Breathe! Reach your arms straight up overhead and hug a block between your palms. Keep your bum and belly from spilling out with a subtle pelvic lift and pulling in of the floating ribs. There should be NO neck tension. Work your way up to holding this “Mountain Pose” for several minutes. As you breathe, look at a focal point. ONLY nose breath, and try to make your exhalations longer than your inhalations. Minus the arms overhead (awkward) practice this Mountain Pose whenever you’re standing–in line, at a party, etc. Try to maintain the alignment while walking as well. What if it’s just too difficult? You’re either too tense, too weak or both but you don’t want to end up looking like Quasimodo? Consider a more classical, mindfulness-based yoga practice where perfecting posture is a priority–not the ubiquitous rapid-fire “vinyasa flow” yoga which can lead to injury. Holding poses for long periods of time is challenging, creates better body awareness, and sets you up for a meditative state, resulting in additional health benefits. “Long Life Yoga” is such a class and has been running for over 10 years in the North Oaks East Rec on Wednesdays at 12:30 pm. Due to popularity, a new session is being added Mondays starting in October. Visit yogahotdish.com for information. Men are welcome to these classes and actually need yoga more than women. They tend to be less flexible by nature and prone to back problems. North Oaks resident John Martin says, ” Yoga’s emphasis on breathing, balance and a level spine has led me to, among other things, much better posture. I am amazed at how much standing up straight contributes to a feeling of well- being.” Dr. Bob Schubert adds, “The yoga practice has really increased my awareness of body position. This kind of input is really helpful in improving posture and avoiding fatigue.” And, yes, it’s OK to come if you just want to improve your golf game! Let’s consider the origins of Vinyasa Flow. The classical school of lineage (to India) and major influence for Vinyasa Flow hearkens back to a guru named Sri K. Pattabhi Jois (1915-2009) and his “Ashtanga” yoga. He came up through the ranks of a master named T. Krishnamacharya in the city of Mysore, India. Krishnamacharya is also the guru of B.K.S. Iyengar (1918-2014), another prominent figure credited with proliferating yoga successfully into the West. FYI, Iyengar was also Krishnamacharya’s brother-in-law, taken in as a disciple upon being orphaned. So, how is it the styles of these two men — Jois and Iyengar — are so different, when they studied under the same teacher? Where as the Ashtanga yoga of Jois features set routines of poses choreographed together with movements familiar to Vinyasa Flow yogis, Iyengar’s method has longer-holds, giving time for intensive fine-tuning of each pose. There are not much in the way of flashy transitions. Iyengar favored normal nose-breathing while Jois favored use of ujjayi breath (sometimes called “ocean sounding” breath ) in the poses. It’s generally agreed that both Jois with his Ashtanga/ Vinyasa Flow and Iyengar with his mindful cultivation of poses are both heirs to Krishnamacharya’s Hatha lineage. But can they both be right? Put it in a historical context, you get an idea that both styles had their place in the stew that was yoga of the late 19th and 20th centuries. Make no mistake, yoga draws a lot from modern gymnastics, even body-building. Many poses we know today in mainstream yoga aren’t “ancient,” but rather borrowed from the West, re-packaged with Indian names and themes. Krishnamacharya was supported by the wealthy Maharaj of Mysore, and enjoyed his own studio in a wing of the palace. Sharing space and possibly equipment, was an elite gymnast of the era. Both men were tasked with improving the fitness of the local population (i.e. school programs) for nationalistic reasons. Thus, the flowing acrobatic movements found in Ashtanga were for “performance” by adept adolescent boys (both Iyengar and Jois performed, often to exhaustion) to entertain and entice people into the practice of yoga. After all, watching someone perform the deeper practices actually found in the ancient yoga texts –like meditating in lotus position– wasn’t too thrilling! But to see all that jumping and contorting at high speeds done in unison by a group of young boys breathing a thunderous breath drew attention! Once they signed on for yoga however, “ordinary” people would receive customized, therapeutic regimes of a few poses held for increasingly longer durations, as well as pranayama (breathing) and meditation guidance, a.k.a the Iyengar method. The yoga sequences of Jois were then basically the “set lists” he and the other boys performed for crowds and kings. It makes sense that Jois taught what he practiced and what we now know as Ashtanga Yoga. So the question isn’t really, “Which way is right?” but rather, “Which way is right for you?” I often encourage my friends who did gymnastics or dance to try out an Ashtanga class or, if there isn’t one, choose a “Vinyasa Flow” at the local health club, CorePower, etc. A person with some natural strength and flexibility will probably fare alright as rooms are often heated to induce flexibility, though not without risks: you don’t always sense an injury coming with your “heat goggles” on; and, the tensile strength of joints can be weaker in ultra-hot environments. For these reasons, I think beginners over 40 should start elsewhere. That said, there are people who, for a variety of reasons, just aren’t ready for a slower moving mindfulness-based practice requiring as much discipline of the mind as the body. ADHD, PTSD and other afflictions are examples–turning inward isn’t a safe or calm place for them, so busier is perhaps better. After working with a purely physical practice for a while, they may be drawn later to the inner practices. So what’s so great about a slower, mindful approach anyway? Well, I find that many of the benefits people seek in yoga beyond strength and flexibility are mental, emotional and therapeutic. Most of the benefits you read about like improved mood, concentration, immune system, reduced back pain, regulation of major systems (endocrine, pulmonary, respiratory etc.) 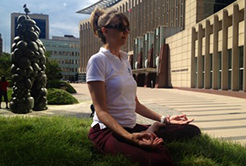 are done on participants in a mindful-based (Iyengar-like) practice, as that’s what’s popular in university settings. In any case, if you’re doing it for a health benefit, read the fine print on the study to figure out what kind of yoga was used–it might not be what’s on offer at your local health club or CorePower. Finally, when in doubt, try it out. No one should expect first-timers to do every pose the first day. Talk to the instructor right before class. No need to call and give your life story ahead of time. I have found, the chattiest callers are the least likely to show up! If you want to know what a style of yoga is all about, there is no conversation that substitutes coming to class! You’ve heard the phrase “the rich get richer.” The “poor get poorer” follow-up is so understood, it’s rarely spoken. While the phrase may or may not be true in the material world, I am here to tell you, it’s absolutely true in the world of wellness and yoga. The people that consistently show up for yoga once-a-week or more enjoy the lion’s share of the benefits. They seem to move gracefully and mindfully through the poses, are unafraid of new challenges and have an overall sense of ease, both on and off the mat. They rarely miss class (don’t they have anything better to do?). To the casual, sporadic yogi trying to make peace with a body full of tension and integrate a scattered mind, it hardly seems fair! So how do the rich get so rich—in yoga? It’s simple: They show up. Friends in from out of town? They bring the friends along. Deadlines? Instead of managing the stress Facebooking on the sly or grabbing a candy bar, they come to class. Wealthy yogis don’t make routine doctor appointments during yoga class. They don’t volunteer to help out a friend during yoga class; besides, their real friends all know they have yoga during that time and wouldn’t dream of imposing! Notice there was no mention as to the abilities of the “rich” yogis. Some are naturally flexible, most are not. Some are athletes, many are not. Some of the “richest” students have major issues—issues that could make for some handy excuses : 45-degree scoliosis curvature, cancer, vertigo, bursitis, sleep apnea, panic attacks, heart issues, artificial knee/hip, pushin’ 90, caregiver of small children/spouse/animal, saving the world, looking for a job, losing a job, running a company, rescuing dogs, early onset Alzheimer’s (good news: the muscles remember what the mind forgets IF you have strong practice). Yet, somehow, these captains of commitment SHOW UP! I marvel and rejoice when I see them walk through the door, week after week, year after year. We’re family—the best kind—the supportive kind! They “advertise” their yoga commitment to friends and family and thereby reduce the chance someone will attempt to impose on that time. They make-up missed classes/ weeks by going to an extra class. They often shoot for twice per week, so if they absolutely have to miss, they’ll at least have gotten to one class. They don’t schedule appointments during class—not for anyone, be it the “best” brain surgeon or best hair stylist. They simply say they have an “appointment” with a serious tone if they feel the other party won’t understand the gravity of their commitment. They have learned to disappoint others some of the time so they don’t have to constantly disappoint themselves. They come to class even if they don’t feel 100%–sniffles, tired, sprained something—we’ll put you on an island and work around it. They do yoga when they travel, either on their own, or they find a class – it’s great way to meet people! They often make friends in class or invite their friends to join their class; this adds a social dimension as well as accountability. They don’t arbitrarily “take a break” and miss a session because they’re going to be “busier”—that means you need more yoga, not less! It’s a simple allocation-of-resources issue: where you put the resources for those 2 hrs a week– that’s what grows. If you put them into grooming, you’ll look great, but you won’t have the benefits of yoga. If you put them into socializing, you’ll have even more invitations that get in the way of your yoga class, but you won’t have the benefits of yoga. If you put them in to working late, your boss will have even higher expectations for your working late in the future. If you put them into helping others, you’ll have even more pleas for help and feel even more overwhelmed. If you put them into your kids, your kids will have no model for self-care and an inflated sense of importance—there’s a reason why, in a plane crash, parents are instructed to put their own oxygen masks on FIRST! Finally, don’t think you need to miss your weekly yoga class once in a while to keep “balance” in your life—your weekly class IS THE BALANCE. It’s the anecdote to all the physical and mental negativity in our lives. Miss it and all that negativity just accumulates. You wouldn’t want your trash collector to come every other week or once per month. Be as conscientious with your health as you are with your trash! Plan for your wellness as well as you plan for your finances—all that money won’t matter without your health, mobility and quality of life. PS. If you’re wondering about the bear, it came up when I googled “rich yogi” so I went with it! That’s Yogi Bear and is buddy Boo Boo, not to be confused with Honey Boo Boo. About once a week, I get an inquiry from someone looking for a yoga teacher training program or, a recent grad looking for a job or mentoring opportunities. It’s easy to see why people want to teach yoga and do what they love. However, from where I stand, there seem to be some troubling (maybe slightly sinister) market forces at work out there concocting a glut of young, under-prepared, overly in-debt teachers. 1) They’re lucrative and provide the lion’s share of revenue for bricks and mortar yoga studios to pay the rent. Starting at $2000-2500 for a 200 hour basic program, you multiply that by 15-20 students participating and you can make a good chunk of change. Moreover, you can wedge in the teacher trainings at off-hours on weekends when the studio isn’t being optimized, say on Saturday evenings or Sunday afternoons. Better yet, offer an on-line component so you don’t even need to provide space. Really? On-line teacher training? Would you like a massage therapist or a doctor trained on-line? But, all the schools are doing it! Why? (see number 3). 3) Student Loans, including PELL Grants can be used for Yoga Teacher Training. Ah haaa! Now we see the real reason for the boom in yoga teacher training programs, and the accompanying college-like tuition inflation. It used to be you could go live in residence at an ashram or a yoga center with a full campus , room and board included for what these strip mall studios are charging for their teacher trainings. Moreover, the demand is such that they can pluck their “lead trainers” from their own in-house schools after they’ve only been teaching themselves for a few years and no one questions it. So, instead of “going to the mountain,” and training in an immersion environment with a cast of experienced teachers from a reputable school of lineage (back to India) as well as teaching assistants, chefs, anatomy professors, etc., you go down the street and train w/ people w/ names like “Nina B.” or ‘Tommy Y.” who themselves have only taught yoga for maybe a few years. Oh, and you don’t actually immerse yourself and live like a yogi because you can’t really afford to quit your day job given the exorbitant cost of the program! Kids ~ this is NOT a good deal! So what is a sincere, aspiring yoga teacher to do? Stop. Breathe. Discern. I don’t want to say that you must put your life on-hold and take an immersion program, but it is the gold standard. That said, what I do feel strongly about is this: don’t pay Ivy League Prices for a Community College program because you couldn’t spot the difference! If you have to study piecemeal or even online, then just don’t pay what you’d pay to go live somewhere; and, keep your expectations in line. If you need to teach yoga to pay your bills, then choose carefully and consider programs where you have not one, but several teachers with decades of experience at your disposal. Frankly, I can’t imagine the egotistical leap necessary for a sole individual of a tender age to claim to be able to teach you everything you need to know about being a teacher. I’ve included some links to some reputable programs which have withstood the test of time; they also have a lineage to somewhere other than the mall or Los Angeles! Some of them even offer SCHOLARSHIPS (i.e. Kripalu). In the meantime, keep up your own practice, study w/ as many teachers of as many styles as you can to narrow it down, save your money and please, don’t go into debt and end up paying even more (with interest) for a sub-standard “canned” program. They will only turn you into a cue-reciting parrot, not a yoga teacher! Kripalu Center for Yoga and Health — Scholarships available! As a Christian perusing some mostly Christian websites, I am surprised to find so many alarmists sounding their angelic trumpets to warn us of the threat of yoga. Really? Are we still on that? I experienced this first hand in a bible study I did at a church in Shoreview, Minnesota some years ago. For those of you unfamiliar, Shoreview is an educated, fairly affluent suburb of the Twin Cities—by no means an exurb. I thoroughly enjoyed coming together w/ my devoted “Sisters in Christ” for coffee, conversation, and inspiration from Beth Moore, a Bible Study celebrity guru. Her videos and workbooks are excellent companions for group study and appeal to Christian women of all stripes. At the end of these 6-9 month studies, tears and hugs abound as we say our goodbyes, having shared our personal struggles and triumphs, prayed and played together. Little did I know, my study leader in Shoreview was praying a bit harder for me. A few months after the study, I received a note in the mail along w/ a copy of a DVD warning me as to the dark, cult-like origins of yoga. I am a yoga teacher and make my living teaching full time. Some might call it “living the dream.” Well, these women, apparently, consider it “flirting w/Satan.” I have no doubt they are praying for my soul to this day, which is great—my small yoga community is thriving. I just wish that God would have given them the courage to confront me in real time, in person. 1)Have you ever been to a yoga class? My experience is most have not and would not go, for fear of being infused by dark forces and Hindu deities. You would find that most yoga classes in America are extremely watered down and secular, to the point of being little more than a great workout, nothing more. There is little if any meditation. Vinyasa flow, so popular in health clubs and mass market studios is really aerobics with yoga moves, that’s it. On the other end of the spectrum, you’ll find “Christian Yoga” which gives you a sermon, of sorts, with your basic yoga. It has been explained to me that a prayerful focus on God (Christian varietal) reduces the threat of unsavory dark forces entering during meditation. I see this as a commentary on our Western Culture: how “threatened” we are by stillness and silence– but hey, if it feeds your soul and makes you healthier, do it! I do think Christian “ministry” yoga should be non-profit ( 501(c) 3), donation-based, and refrain from “scare tactics” to grow their business. 2) Do you know where those “yoga moves” come from? Well some may tell you they’re thousands of years old, really the physical postures we see today were “borrowed” from calisthenics which the local Indian population observed the colonial British Military practicing. A sun-salutation can look an awful lot like an old-fashioned “burpee” from your phy-ed class. The truly “ancient” yoga was pretty limited to sitting meditation, (and poses to limber up for sitting), breathing exercises, hand positions and breath control exercises. The physical, Hatha pieces were really a way to promote a higher degree of fitness in the Indian population—nationalistic yes, in case they had to go to war against their occupiers, perhaps? Giving the calisthenics “Indian” names was an logical selling point. Instead of “lunges” and “planks” we have a warriors and chatturangas. I am tempted to make the argument that a few savvy Indian gurus of the 19th and 20th centuries were a lot like the Japanese car manufacturers: they borrowed Western techniques, put their own unique stamp and lexicon on it (think “kaizen”) and sold it right back to us! 3) Do you know that “meditation” has a rich history in the Christian Church? St. Teresa of Avila, Spain had students sit and stare at objects like rocks and shells in the 1500’s to focus their attention so they could pray more deeply. She was known for her pursuit of “bliss” and ecstatic states. Walking meditation is popular as well, evidenced by the number of labyrinths in churches around the world. 4) Do you know that meditation is just a higher form of concentration, a means of creating a single-pointed focus which can be directed to a multitude of things, from the breath, to God, to hitting a golf ball better? 5) Do you know that Hatha yoga (the prevailing style of yoga in America) exercises are “meditations in motion,” in other words, that the focus becomes the fine tuning of the posture and that the mental state is akin to that of an athlete “in the zone”? 7) Finally, do you know there are only about 600,000 practicing Hindus in America? With 20+ million doing yoga, if it were really a “gateway” to Hinduism, wouldn’t the number of Hindus have exploded by now, in line with the yoga trend? In addition to the 600,000 practicing, The Huffington Post reports 1.2 million “self-identify” as Hindus, meaning they may participate in bigger celebrations (Creasters anyone? )—and most of them are of Indian ethnicity. 8) If you calm your mind and slow it down, are you fearful that a Hindu Deity might worm his/her way in to your subconscious? If that were the case, wouldn’t there be millions of newly-minted, “all-American” Hindus chanting to Kali or Vishnu? According to Stephen Huyler, author of Meeting God: Elements of Hindu Devotion, “Hindus rarely proselytize; most respect the rights of others to their own beliefs. According to the tenets of Hinduism, all philosophies and beliefs are considered equally valid paths to salvation, and it is thought inappropriate to judge the choices of others.” Of course, exceptions are cited, such as “politically motivated disturbances such as the Hindu-Muslim or Hindu-Sikh riots.” Most Hindus would be quite supportive and accepting of the Christian God, as they too are monotheists? – you knew that, right? 10) Newflash: the biggest threats to your mental, physical and spiritual wellbeing are probably some combination of stress, anxiety, poor posture/breathing/digestion, depression, obesity, etc.—why be so critical of a wellness system designed to combat them all, helping you to be a healthier, happier and better-adjusted person? Sure, if you go back a couple of millennia, you can find some strange rituals associated with various sects of yogis, but have you read Genesis? What if due to needing an outlet for your frustration or paranoia, you “turn off” someone to yoga who really needs it? What if that someone is…YOU? Talking while driving? Overrated. Texting while driving? Illegal. Living in the ‘burbs like Shoreview, North Oaks or White Bear, you probably spend around 200 hours/year commuting; and, maybe it seems like all 200 of those hours occur in the summer months when you’d rather be doing anything BUT driving. Closures, jams, detours got you down? Try driving meditation–you’ll calm your mind and keep yourself and fellow commuters safer on the road. For more, check out the article in Time Magazine here. What if you could undo almost all those negatives with one thing? Would you try it–even if it seemed a little new-agey crazy? Did you know that meditation is proven to boost your mood and energy, while decreasing anxiety? Did you ever consider you could improve your posture while driving and reduce back pain? What if the same “fix” could lower your blood pressure and cortisol levels, making your commute more relaxing? Would it be worth switching off the radio, cell phone and giving it a try? Metta or “loving kindness” meditation: When someone cuts you off or doesn’t let you in, send them compassion/ loving kindness. Think: they must be really stressed out, had a terrible day and just can’t help themselves at this point in time. That’s OK~ I’m in a better place and can make way. Instead of making your blood pressure spike, you’ll feel a magnanimous generosity, like you’re doing a favor for the greater good. Often your paying extra attention will make-up for another driver’s poor focus and maybe even prevent an accident. Make your driving Japanese “joozu” : A high level of concentration is a jumping off point to meditation. In Japanese, the word “joozu” implies a sense of mastery and skillfulness. I’ve noticed it used in describing performing everyday activities Westerners wouldn’t, well, notice: cutting up carrots, writing in cursive, folding laundry. “Yamada-san, your keyboarding is totally joozu–you hardly make mistakes.” (loose translation). It’s just another way the Japanese bring mindfulness into everyday tasks. So, when you take to the road, imagine you’re a masterful ninja, cultivating your craft. Since Google hasn’t quite taken over that aspect of our lives, why not put all your focus into being the best driver you can be? How gradually can you apply the breaks? How carefully can you observe the 2-second rule? Treat it like an athletic event and maybe you’ll get into a state of flow. Zazen: focus on the spine. The good news is that cars have become safer; the bad news is that they do so by putting us into evermore fetal positions, so we’re prepared to crash. Think about the old “bench seats” back in the day, conducive to sitting up straight. Nowadays, our bums are in “buckets,” our shoulders are pushed forward and our heads and necks follow suit, chins craning ahead. The spine starts to bow out, losing it’s natural curves at the back of the neck and the lumbar area. What if you focused on trying to relocate your shoulders back to your side bodies, at the end of the chromium processes where they belong? Once again we turn to Japan for the method: make small adjustments, perfecting your spinal alignment (as in “sitting zazen” ). For instance: widen your collar bones, but don’t forget to send the occipital ridge of your head (where it joins the neck) back to align w/ the new shoulder position–maybe slightly pressing in to the headrest. While it’s hard to have great posture while driving, it could be “less bad.” You might find you can somewhat adjust your seat, creating more lumbar curve and importantly, more curve in the back of your neck. You’ll know you’re improving when sitting actually becomes easier and requires less effort–nothing fatigues the back muscles like poor posture! WARNING: Driving meditation might seem difficult at first, primarily due to the absence of noise. The “monkey brain” seeks distraction from anything unpleasant. Over time however, you’ll start to crave the peace and quiet. The second you switch off your phone or radio, you’ll have a relaxation response, finding it a tremendous relief. The simple act of driving provides enough sensory inputs to be amusing; you really won’t miss all those commercials and calls. In the end, what might be your biggest incentive for practicing driving meditation is when you see how little attention others are paying to the road– it might just scare you into becoming a great guru! 1) Test drive new outfits. Before you pull the trigger on that cute top at Lululemon or think you can just get by with your retro tennis shorts, try a few poses in front of a mirror. Things that seem secure and respectable right-side-up may not be gravity proof. Trust us, no matter how good looking you think you are, we don’t want to see your bits and bobs. The phrase “let it all hang out” is figurative people! 2) Enter the room with decorum. Whether you arrive early, just-in-time or better late-than-never, roll in like the fog, “on little cat feet.” Remove your shoes, coats, etc in the foyer. Avoid the “mat snap” and try to set up with an economy of motion. If you’re late, you may have to wing it with props and instructions. The instructor may not be able to give you assistance in setting up without compromising the flow of the class. It’s fine to be late, as long as you’re not obtrusive. Similarly, it’s fine to be early, but please don’t expect instructor attention until a few minutes before class. Many instructors have room set-up and/or like to “center” with their own yoga and meditation before teaching. Cell phones off and put away. Special lenience for “first responders” and caregivers of all stripes who may need to leave cells on “vibrate” nearby. 3) Leave chatting to the foyer, or for after class. Chatting with your neighbor, even in hushed tones, and even if your neighbor is receptive during the opening minutes of class can affect the instructor’s ability to demonstrate opening poses, end the class on time, and stay focused herself. It also affects the students who arrive early in order to get their own extra “centering” time in before class. The day is full of numerous opportunities for noise, conversation and chaos. Try to think of the studio as a haven and realize that many are there seeking solitude on some level. Socializing after class however, can be rich and rewarding. 4) Don’t be a queen bee. Yoga is about acceptance of everyone in the space, cultivating awareness and going beyond your comfort zone. Try to be mindful and open when socializing with other members of the class, not just in your speech but in your body language. Is your body language closing off the people you may not know/like and favoring others? Don’t be condescending to beginners; mind you, they may be accomplished yogis from another style or have some daunting challenge you can’t fathom. Try to treat everyone equally, and, if you get together with a few of your classmates outside of yoga, try not to discuss it in front of everyone else. No one comes to yoga to feel left out! 5) If you are disturbed during yoga nidra/final relaxation, just leave the room. Whether you’re having a prolonged muscle spasm, multiple hindrance attack, coughing or sneezing spell, it’s best to step out. In higher states like yoga nidra, our awareness is such that we can literally feel others’ squirming and discomfort. Think of the air more like water: your movements create ripples that move throughout the room. If you can’t settle yourself /solve your problem in the first few minutes, then it’s best to leave and not affect the experience for everyone else, especially for the beginners whom are struggling already with yoga nidra and savasana, “the most difficult pose.” Once you leave, best to stay out — can you find somewhere else to do seated meditation until class is over? If you anticipate you may need to leave early, pack up as much of your gear as you can outside of the yoga space, and don’t worry, we’ve all been there! 6) Breaking wind: it’s OK. Say “excuse me” or ignore it, whatever works. We’ll all just move on. Holding it in isn’t very healthy or “yogic.” That said, if you know you’re having issues, it doesn’t hurt to self-quarantine on the community’s edge. Everyone will have a turn at dealing with something, so you will probably receive more empathy than judgement. 7) If the personal habits of others in practice bother you, observe your own habits first, especially if you plan on complaining. Yoga is a challenging practice and can be awkward, especially for adults. Think the person next to you is breathing too loud? Maybe you’re not breathing loud enough. Sure, the allergy sufferer always seems to be blowing his nose, but maybe you have B.O. If it really gets to you, it’s most likely your mind looking for a distraction. Perhaps you can practice Buddhist “metta” meditation of sending such a person loving kindness and compassion for their issue. That said, it’s not wrong to want to avoid setting up your mat next to certain people but, if in the event it’s unavoidable, recognize it as part of the practice. 8) Try not to monopolize the instructor’s time and attention. Personalized service is one thing, but after several weeks or months in a group class, a certain amount of self-sufficiency will be expected. If you are constantly having issues, you may be a candidate for private yoga. If you can’t seem to “get up the curve,” remember modifications, overcome limitations, you may have to realize that a group setting just isn’t right for you or fair to everyone else. Instructors expect to give new students extra attention, but not to the extent it affects the collective experience time and time again. The ability to move from seated to standing positions without assistance is key; if your’e not able, you probably need yoga! That said, you should start with private classes until you get your bearings. 9) Try not to attend an established class sporadically. This is the corollary to no. 8. If you’re new to yoga, a bit out of shape, started yoga later in life, etc., you may not have the muscle memory or the mental memory to attend yoga once-in-a-while. The worst case scenario is you take a few classes, get down the basics and then go on hiatus, only to return and flash everyone else back to your personal square one. Once a week is a minimal commitment in yoga; if you can’t do that, then consider something else. You’ll only put yourself at greater risk of injury and your class at greater risk of aggravation! For those who travel or it’s just a scheduling impossibility, you can probably make a go of it by doing a minimal home practice (10-15 mins) a few times a week. You can also find classes where you’re traveling–your instructor may even be able to recommend. 10) Go with the flow. baby! If yoga has one life lesson to teach us, it’s that pretty much everything is beyond our control; or, as one of my favorite teachers says, “let go for dear life.” If the temperature of the room, the person breathing next to you, a class cancellation, the tag on your shirt are driving you nuts, then know this : you really need yoga! Maybe your practice should be more focused on “riding the wave” of meditation (breathe-relax-feel-watch-allow) and less so on performing the perfect pose. Follow these and you too can be Yogadelic!